You might think that things are all fun and games, joy and peace over in THRIVE land but it is not so. When Lady Jen started THRIVE in 2002 she was on disability for her emotional state and did not expect she could ever hold a real job or return to society. She did not like remembering being so depressed that she had to be hospitalized at age 11. She knew that sometimes she could do well in school but at other times her emotions were so out of whack that it took a week�s concentration to fill out a form. Learning the THRIVE skills in her own life became a turning point. By 2004 her intellectual abilities were much more available and by 2006 Jen was leading THRIVE training for others. 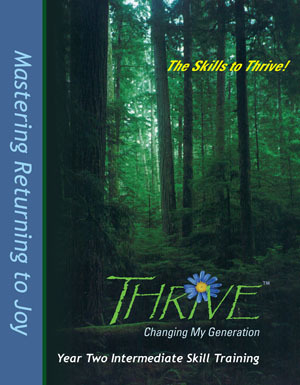 The second year of THRIVE is all about emotional recovery skills. These exercises are the practical steps to retraining your brain if something has gone wrong along the way. The order of the training and careful instructions have all been laid out carefully by Lady Jen. Do you think she takes this training seriously? Jim continued to make sure that every exercise is designed correctly but if, like Lady Jen you are on a mission to change your life and learn to function, change your generation and enjoy your life � you are going to love this workout book. The next 50 weeks can change your life. We still know that no one can practice what he or she has not learned. Trying to do these practice exercises when you have not learned the skills doesn�t work. You can learn the skills in the 34 � hours of training in each year of THRIVE and once you finish Track II this practice book is just what you need. Be as serious about your training as Jen is!